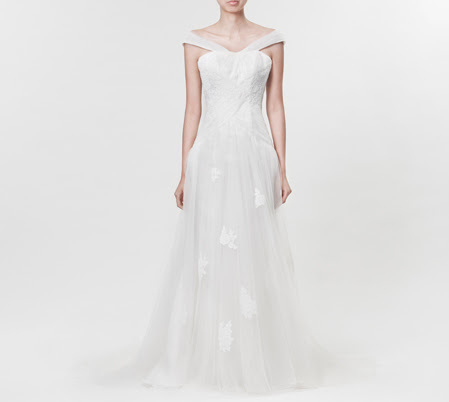 As with every other bride, the moment I know I am getting married, I am ready to get my gown. :P After so many years (well, literally that's true) of looking, I pretty much know that I am getting a Lusan Mandongus or Annasul Y at Designer Bridal Gown, KL. They sounds like you are getting lots of stuff for your bucks. However, I know deep down inside I only need 1 wedding gown which cost $2,000 to rent alone. And given Mr's relatively tall size, most of the suit of the rack doesn't really fit him well. So after we left Tanjong Pagar road, I told Mr "Why don't I take $2,200 from the $2,788 to buy a gown when you take $588 to tailor make a suit?" Mr wears a suit quit often, so he can re-use them quite frequently. And so off we went to KL. The 6 dresses I tried during this visit. Numbered according to the sequence I tried them. Things have changed slightly at Designer Bridal Gown, KL. Instead of unlimited trying of gowns, one can only try 5 gowns from the rack, unless you pay RM2000 "to join as member". 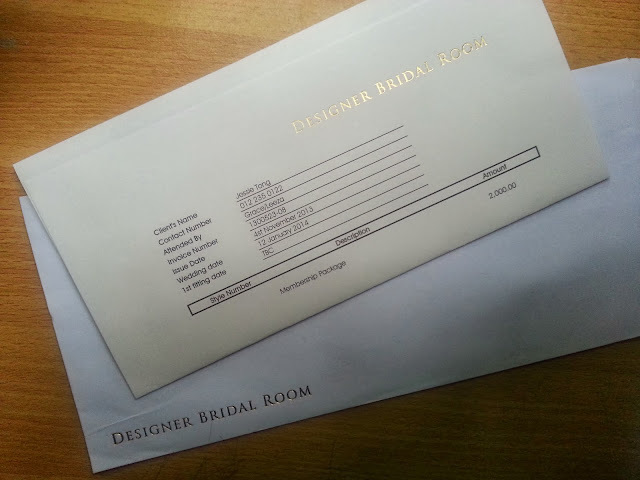 The membership fee is deductible from your eventual dress purchases, and on top of that, you will get RM1000 discount off the price-tag immediately. Oh, by the way, they keep quite a good record of all dresses each customer tried. So don't think you can cheat the system by going back multiple times. But if you can, let me know! Actually, after going through the process, I think limited to only 5 gowns really makes one be very careful and selective when choosing the gown. And it really narrows down the choices so that it actually makes it easier to make the final decision. Not surprisingly, all 5 gowns I chose was either Annasul Y or Lusan Mandongus (they do have other brands!). And I managed to pick them out without even looking at the labels. I guess I am really drawn towards the soft feminine style for these two labels. 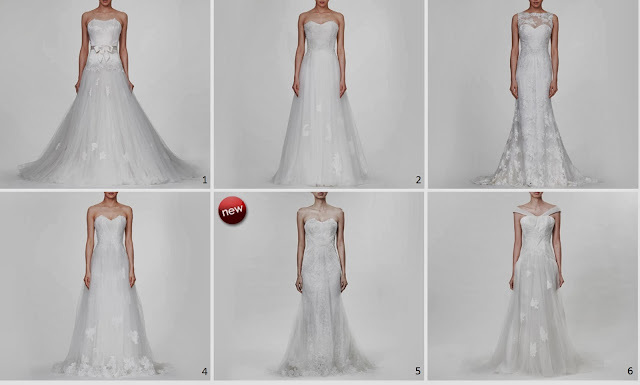 The following pictures are taken from Designer Bridal Room online store. In case you don't know, they have an online store where price is cheaper than their showroom. Why people would buy a wedding dress online is something that baffles me. But what will stop me from buying the gown from their online store after trying the actual dress is also something they will need to work out. And more importantly, the pictures shown at the online store doesn't do the gown justice at all! I have been stalking their online store since the launch and nothing caught my fancy.But things are totally different when I see them in the store. Here's the first dress I tried. 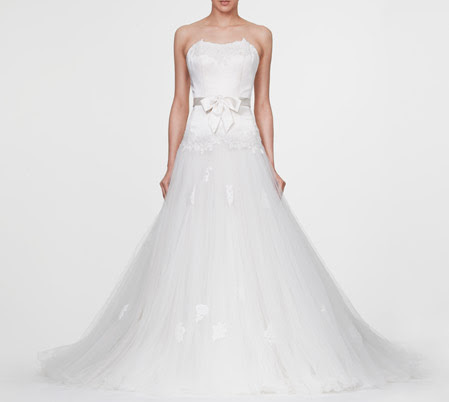 It has a satin bodice, a drop waist and skirt made up of countless layers of tulle. I always think that I can't carry drop waist due to my petite height (160 cm) but this dress proof me wrong. Apparently, with the correct cutting, drop waist can really flatter your body shape. However, the tulle skirting is a bit messy in my opinion and slightly too big to my liking. This dress is retailing at RM10,800 (or RM11,800) in the store and available for RM8,400 online. The second and the forth dress I tried are pretty similar - sweetheart strapless neckline, bodice that ends on the waist and A-line dress. I thought this cut would be the most easy to pull off. But I was wrong. For some reasons, I look fatter in these 2 dresses and not flattering at all. The difference between these 2 dress are the different lace pattern on the bodice and the different lace appliqué on the dress - Candy has randomly distributed lace while Celeste has lace bordering the hemline. I prefer the bodice of Candy but the skirting of Celeste. In fact, I am not the only one. I was told that there was a bride order made her dress exactly just that: Candy bodice and Celeste skirt. Well, too bad I don't have enough time to order a new dress. I remember both were retailing at RM8,800 in the store; but Candy was slightly cheaper at RM6,600 at the online store, while Celeste costs RM7,350. I love the fifth dress. It is exactly the style I love most - understated luxury. I have this irritating preference for stuff that looks simple at the first sight, but in reality is much more complicated. This dress is just that. 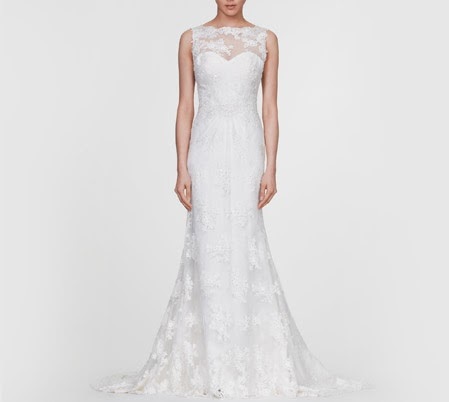 Underneath the simple layer of lace-appliqué tulle is actually a layer of lace that's so delicate that it melt my heart just looking at it. But such a luxurious fabrics was hidden from plain eye sight, giving only a slight shadow of it if you look carefully. I almost getting this one, retailing at RM8,800 in the show room and available for RM7,600 online. Then we thought, since I am getting a dress from Designer Bridal Room anyway, shouldn't we join the membership and try out a few more pieces just to make sure we didn't leave out The One? That's what we did and I tried the last dress of the day - Citrus from Annasul Y's diffusion label Snow. But what makes us really excited is the price tag. 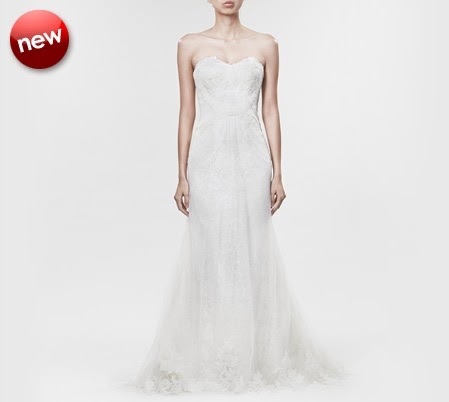 This dress is retailing at RM4,800 in the showroom and available at RM3,840 online. That's almost half price from other dresses that I have been trying! Citrus. Snow by Annasul Y.
I love the bodice. 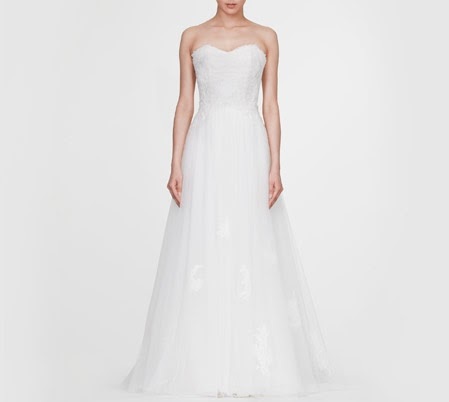 I love the way the tulle was carefully and delicately weave into body-flattering pattern. However, the skirt is slightly disappointing in comparison. It is made up of 2 layers of tulle on top of so-so quality satin, not the rich creamy type that I experienced from them. 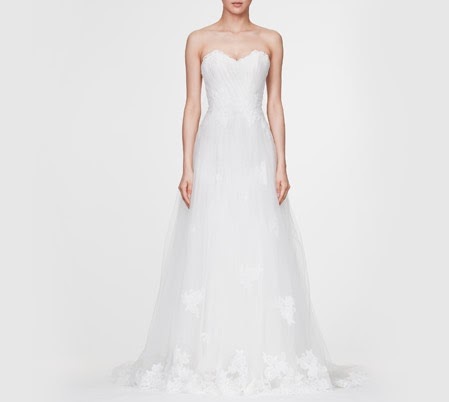 There is not enough lace nor enough tulle to create the dreamy flowy feel that I associate with this brand. But I guess for this price, something has to be compromised, isn't it? Any questions on wedding preparation in Bali or about something I have written on the blog? Feel free to drop me an email or leave a instant message on my Facebook chat!